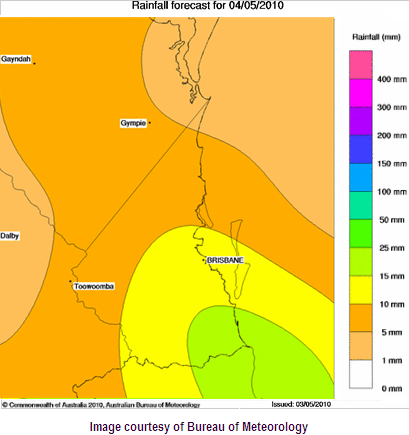 Up to 15-25mm of rain may fall around the Gold Coast in the morning tomorrow, Friday 21st May 2010, then tending towards showers in the afternoon/evening with possible thunder. cloud will increase over much of the state with patchy, mostly light rain areas contracting east on Friday. Rain tending to showers and isolated thunderstorms will then be about the southeast corner of the state on Friday afternoon. 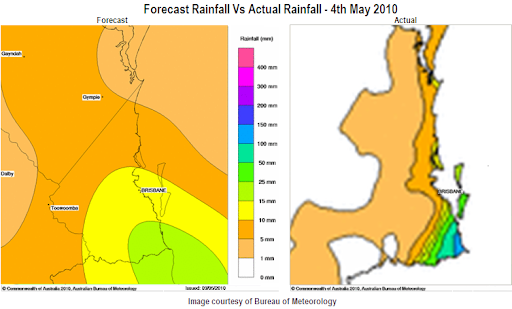 The computer generated rainfall forecast images (left) predicts falls of between 10-15mm across most of the Gold Coast, with slightly heavier falls of 15-25mm right on the Coolangatta-Tweed Border. 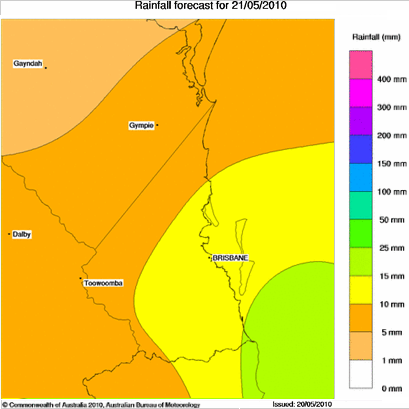 However, this forecast rainfall image looks somewhat similar to the one back on the 4th of May, when we predicted only up to 25mm of rain, then it ended up actually being up to 170mm (as per extract from the Forecast Rainfall image from the 4th May 2010 to a zoomed in image for the Actual Rainfall image for Queensland for the same day). Looking forward into the weekend, showers will clear on Saturday morning as the trough that generated the patchy rainfall will move offshore of the southeast coast early Saturday. Sunday should then remain fine with a top of 23 degrees, however showers are expected to return again on Monday. Thanks for your comment. Weathergc.com is a blog about Gold Coast weather containing links to local forecasts, warning and weather observations from official sources.